The Angel Basket is a creative Arrangement of 30 red roses, greenery and fillers in a round basket beautifully done by our florist. The artistically arranged Angel Basket makes a thoughtful gift suitable for any occasion. The beautiful and bright fresh red roses gracefully convey your warm feelings to the receiver. You can send rose bouquet online or get it hand delivered by our home delivery service. We also offer same day service and midnight deliveries for special occasions. 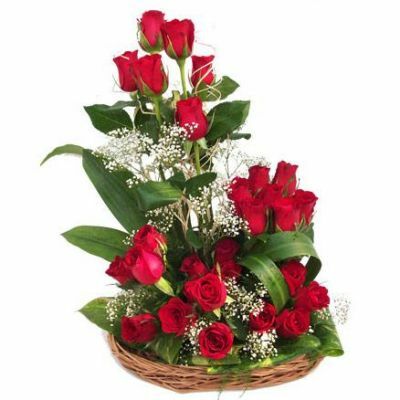 Send flowers online to make your special occasion even more special and impress your loved one with our pretty bouquets. • Free Same Day Home Delivery Service Available • Free Home Delivery Service Available Consider for: Birthday, Wedding Day, Anniversary, Baby Showers, Retirement, Mother's day, Father’s Day, Gifts For Boss, Gifts For Him, Gift For Her, Valentine's day. We Offer home delivery service for flowers including same day delivery and midnight delivery. Home Delivery | Send Flowers | Flower Bouquets | Florist | Same Day Delivery | Midnight Delivery.